I've been to many shows over the years but no matter how many, the preparations the night before are always stressful. Getting ready for my first Intercollegiate Dressage show, as a coach, was no different. And this show lasted two days so it included an overnight in a hotel. So with list in hand I hurried around packing and checking I had everything I needed. 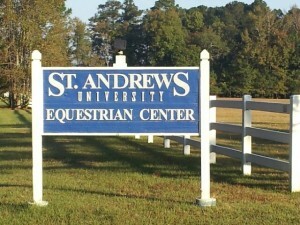 The St. Andrews Equestrian Center is almost three hours from my house and we needed to be there by 9am for the coaches' meeting. I like to give myself extra time, just in case, and I had also offered to car-pool and pick up some of the team on the way. It made more sense for us to travel together. So with my case packed and the alarm set for 4am I bid my husband and daughter goodnight. They were acting as if I was going away for six months not for just one night. As I lie in bed at 9pm I realized I had never been away from them before. I would like to say I didn't want to leave them but that wouldn't be true. I was excited for a girls weekend filled with horses! I struggled to fall asleep and as is always the case when I have to be up early, my night was restless. Tossing and turning and constantly checking on the time to make sure I hadn't slept in. I was, of course, hard and fast asleep though when the alarm finally went off. The house was cold and quiet as I tip-toed around, even the dog didn't stir. I fixed some coffee, pulled on my clothes and loaded up the car. Apparently my list wasn't complete as I set off three times before returning for things I had forgotten. One time almost knocking myself unconscious on the trunk of the car. They say things happen in threes so I was confident that the worse was over and the weekend was going to be a great success. I never look forward to getting up early but once I am up, dressed, and have at least a mouth full of coffee in me I am ready to go. There is something so very special about being awake when everyone else is still asleep. It feels kind of clandestine. As if I'm sneaking around somewhere I shouldn't be. The roads were almost deserted and I thought I knew where I was going but the GPS on my phone had other plans. It brought me off of I77 earlier than I expected and instead of a straight shot along W. T. Harris it wound me around narrow country roads. I was so sure I was going in the wrong direction I pulled over at one point to check my final destination. Satisfied I was still on the right track I continued and arrived at the CVS on North Tryon just before 5:30 a.m.
A few minutes later everyone else arrived. I was so glad I'd decided to take my van rather than José's truck as we loaded in bags, show clothes, chairs, and a cooler. Blair rode shotgun and Taylor and Iman settled in the back. The sky was still pitch black and the air chilly cold. We headed to I485 and were on our way. After a short while we left the freeway and began a long trek down a desolate highway 218. Note to self: never travel along this road in the wee small hours if a bathroom break will be required. Eventually we made it to Polkton and turned onto Route 74. A smooth, modern, four-lane highway we headed east and watched as the skies slowly illuminated with fresh morning light. The beginning of a brand new day. Taylor and Iman had slept most of the way and were just stirring as we approached Laurinburg in Scotland County. A fitting name I though seeing as the college we were heading to was called St. Andrews. A quick peek at the town's website proved that the area had in fact been settled by Scottish immigrants back in the 1800s. We were all very impressed with the wide, sweeping, tree-lined drive that led to the beautiful, modern barn, acres and acres of pastures, and a multitude of indoor and outdoor riding areas. We had plenty of time to spare. We strolled around exploring until the 9:00 a.m. coaches' meeting. Posted in Horse Shows. Tags: horse show, IDA, Intercollegiate Dressage, St. Andrews Equestrian Center on October 29, 2013 by Carol A. Mejia.